When connecting a MC or MM system with a phono stage, the most important things to consider are input capacitance (for MM systems) and input resistance (for MC systems). Usually this is done be DIP switches or external connected capacitors. That means you cannot do this from your listing position and it is not easy to hear the differences between different settings. 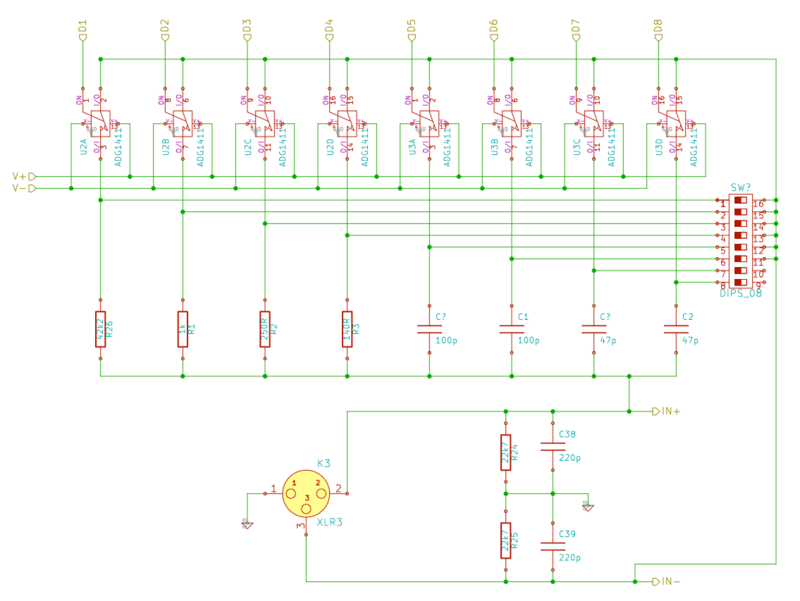 This the following input stage, all switching is done by low-resistance analog switches. These switches can be controlled by a digital circuit (e.g. a microcontroller). That makes it easy to implement a switching of capacitance and resistance using a remote control. The selected analog switch is the ADG1411 from ADI. It features 4 independent switches, can run at +/-15V 8 and has an Ron of only 1.5Ω. This entry was posted in Projects and tagged analog switch, digital, electronics, phono on June 5, 2013 by Daniel.